… to establish an association whose goal was to promote the Križevci region, but also bicycling in general. The association is called the Križevci Association of Bicyclists, or KUB for short. In the first year or two, the association brought together bicyclists and it planned joint rides, both through the Križevci area and for joint trips to bicycle tours, marathons, etc. In 2009, the association marked about 30 kilometres of forest trails around the city of Križevci with the assistance of resources from a project to stimulate the development of thematic tourist trips being carried out by the ministry of tourism. After the success of the first project, the members of the association continued their efforts. In the next few years they organized several bicycle tours. 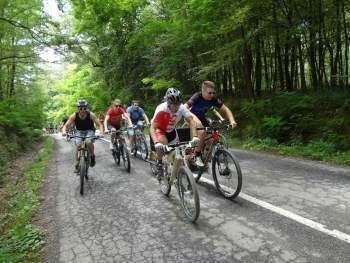 We want to mention in particular the now traditional Easter Bicycle Tour, which is organized in cooperation with the Križevci Auto Moto Club and the autumn family bicycle tour. Both of these events are organized every year. In that same year, KUB also started the XC League “Ratarna,” a group of races in the forest around Križevci which has been held for two seasons. In 2014, the tourist board in cooperation with KUB completed the project for marking bicycle routes on roads and the production of bicycling maps. That same year, KUB in cooperation with the city of Križevci participated in the project BA Biking with financial support from the European Union.